I am moving soon and have been eating out my freezer and cabinets to reduce what I have to pack. I had two partial boxes of GF and vegan cookies, one chocolate chip and one vanilla animal crackers. I also had a package of frozen strawberries in the freezer. When I was at Whole Foods last week I bought a package of Coco Whip. 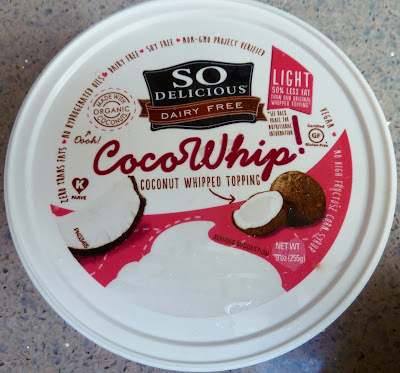 There is True Whip which has dairy, but this is the first time I have seen a dairy free option that is a healthier alternative to Cool Whip. These few things were perfect for making a no bake strawberry cream pie. I just made up the recipe. I used my no bake pie crust recipe for the crust and made my strawberry sauce recipe with the frozen strawberries. 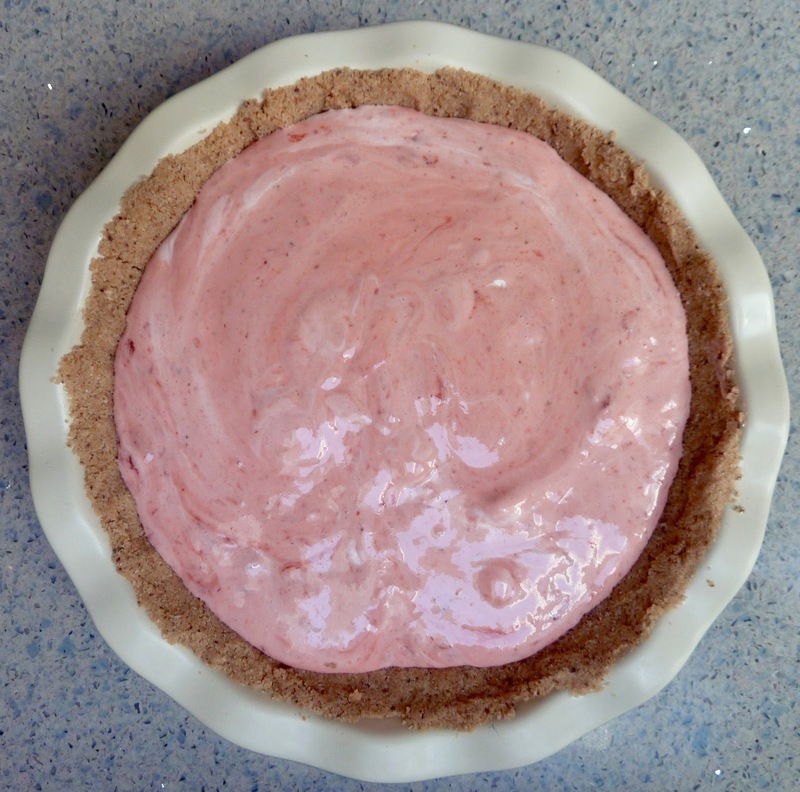 I folded the cold strawberry sauce into the coconut whip and voila, a pie filling! I think that a recipe of coconut whipped cream in place of Coco Whip would also work to make this pie. I froze the pie crust before adding the filling. Freezing the empty crust prevents the crumbs from mixing in with the soft filling. Then I froze the entire filled pie until it was firm. I do not know how long it takes for the filled pie to freeze completely, probably overnight. I actually forgot to serve it when friends came over (moving is very stressful). It stayed in the freezer for several days before I took it out to try it and take blog photos. 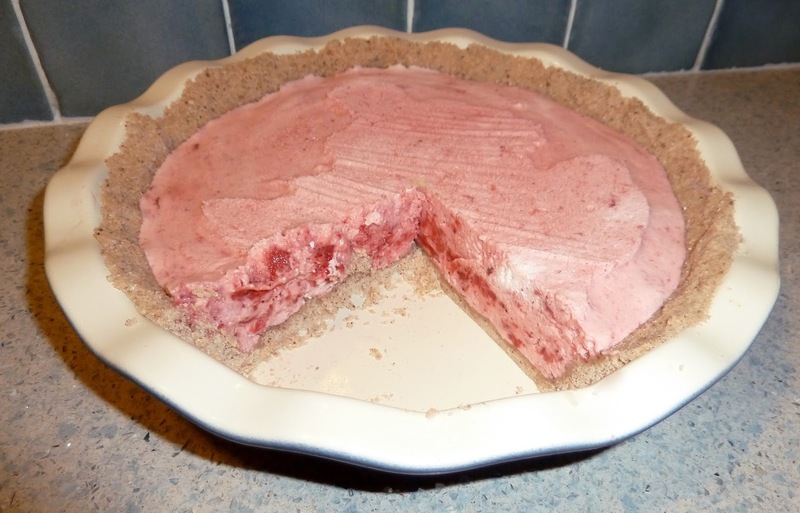 The frozen pie cuts easily and very neatly. It tastes great right out of the freezer or you can let the slice sit for a while and eat it all soft. 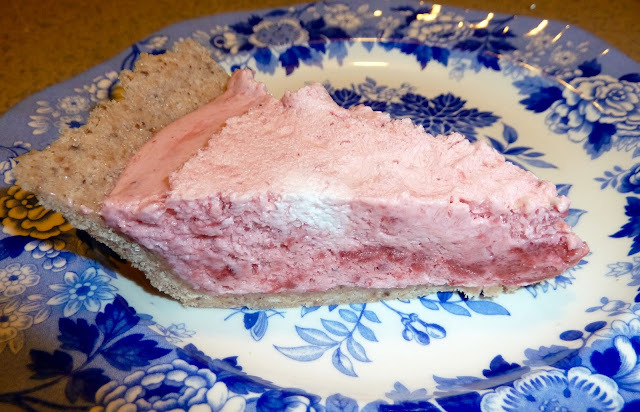 The frozen pie is like an ice cream treat and the soft one is like a cream pie, both ways this is a delicious and refreshing dessert. Grind the cookies finely in a food processor or put the cookies in a sealed plastic bag and crush them with a rolling pin until very fine. Mix the crumbs with the sugar and xanthan gum and then add the oil and mix well. Crumbs with oil, sugar and xanthan gum in the pie pan. Press the crumbs along the bottom and sides of a pie plate. Put in the freezer while you make the filling. Crumbs pressed along the bottom and sides of pie pan. Place the 1/4 cup of sugar, and 1 Tbs. of cornstarch into a saucepan and mix well. 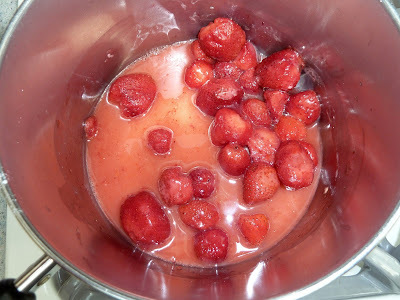 Add the 1/4 cup of water and strawberries and stir. Frozen berries and all the other ingredients in the saucepan. Note that the liquid is cloudy. Bring to a boil over medium heat and then lower the heat and simmer, stirring frequently, until the liquid is no longer cloudy (about 8-10 minutes). Crush the strawberries with a potato masher or the back of a wooden spoon. Mixture simmering, note that the liquid is becoming clear. Allow the strawberry sauce to cool completely. I put it into the fridge to speed up the cooling process. After crushing the strawberries with a wooden spoon. Fold the Coco Whip into the cold strawberry sauce. 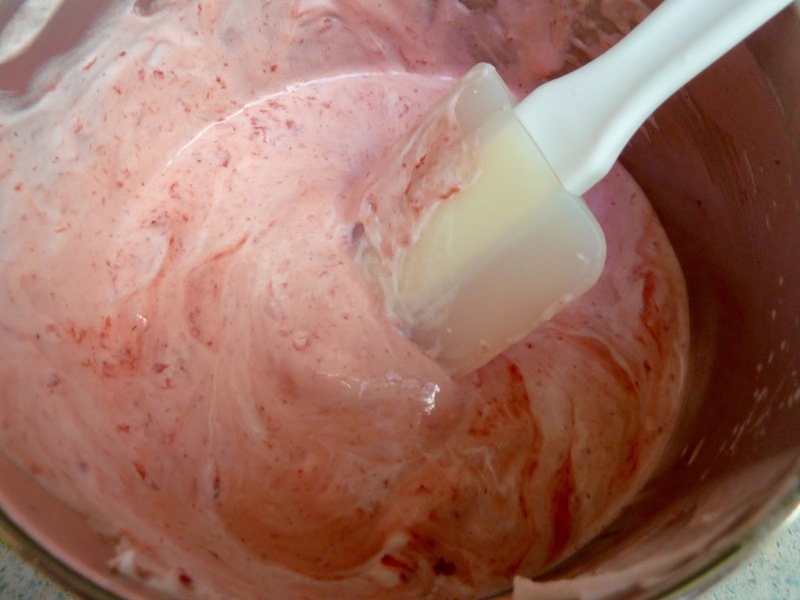 Folding strawberry sauce into the Coco Whip. 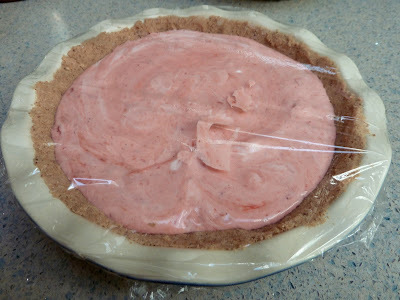 Pour the mixture into the frozen pie crust. Cover with plastic wrap and freeze until firm. Frozen pie is easy to cut and serve. It is like an ice cream pie when frozen. Allow the cut pieces to rest at room temperature if you prefer a creamy texture. Pie covered in plastic wrap. because the frozen pie had a flat top. Frozen pie with a plastic wrap flat top. GLUTEN FREE VEGAN NO BAKE STRAWBERRY PIE Makes one 9” pie. Ingredients CRUST 8 ounces GF and Vegan Cookies - finely ground or crushed 4 Tbs. Vegetable Oil - I used canola 3 Tbs. Sugar - I used evaporated cane juice crystals 1/4 tsp. Xanthan Gum FILLING 10 oz. package Frozen Strawberries (or 1 pint fresh strawberries) 1/4 cup Sugar 1 Tbs. Cornstarch 1/4 cup Water 1 9 ounce container Coco Whip (or one recipe of Coconut Whipped Cream) Directions: First make the crust Grind the cookies finely in a food processor or put the cookies in a sealed plastic bag and crush them with a rolling pin until very fine. 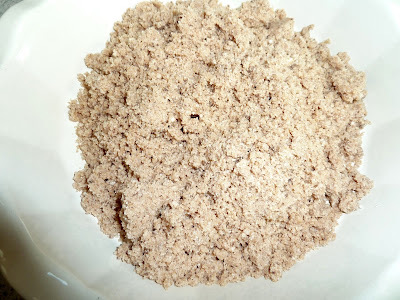 Mix the crumbs with the sugar and xanthan gum and then add the oil and mix well. Press the crumbs along the bottom and sides of a pie plate. Put in the freezer while you make the filling. Next make the filling: Place the 1/4 cup of sugar, and 1 Tbs. of cornstarch into a saucepan and mix well. 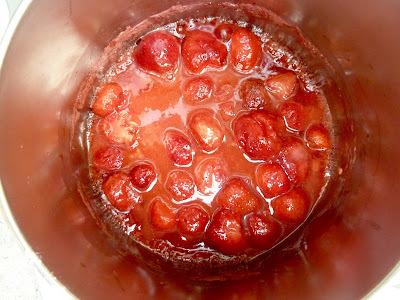 Add the 1/4 cup of water and strawberries and stir. Bring to a boil over medium heat and then lower the heat and simmer, stirring frequently, until the liquid is no longer cloudy (about 8-10 minutes). Crush the strawberries with a potato masher or the back of a wooden spoon. 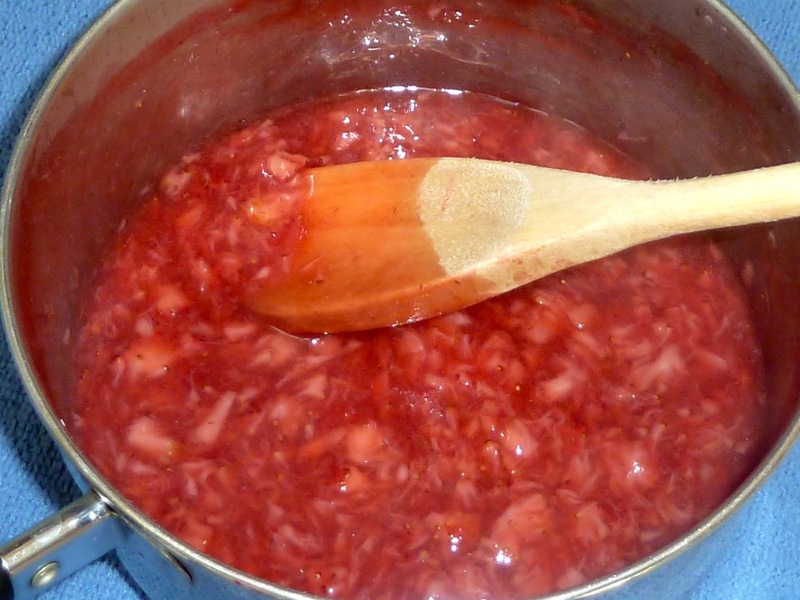 Allow the strawberry sauce to cool completely. I put it into the fridge to speed up the cooling process. Fold the Coco Whip into the cold strawberry sauce. 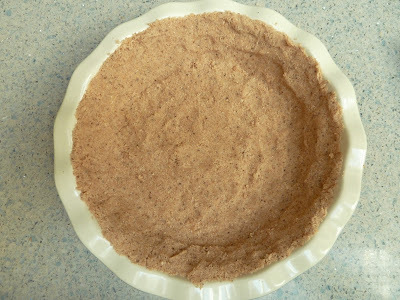 Assemble the pie: Pour the mixture into the frozen pie crust. Cover with plastic wrap and freeze until firm. 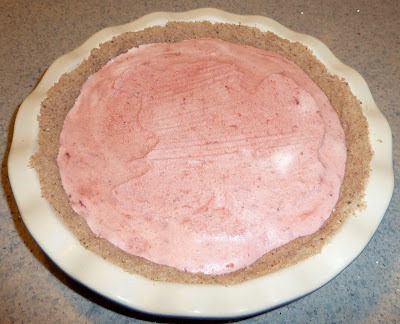 Frozen pie is easy to cut and serve. It is like an ice cream pie when frozen. Allow the cut pieces to rest at room temperature if you prefer a creamy texture.